Big data is more than a buzzword – it is the foundation of all of the major trends in retail banking in 2019, and the best way to improve the customer experience at your financial institution. Data analytics can help your organization better understand your customers, members and prospects as well as their purchase and loyalty journeys. By gathering insights from various sources and channels, you can learn about the attitudes, beliefs and behaviors of your customers and create meaning around communication and engagement. This will help acquisition, onboarding, relationship growth and loyalty. When financial institutions use data and analytics to create personalized engagement, they position themselves as caring about the customer as an individual and are able to proactively provide recommendations and advice that is contextual – in real time. This is the type of experience consumers are receiving from the most revered organizations in retail, hospitality, travel and all other industries. 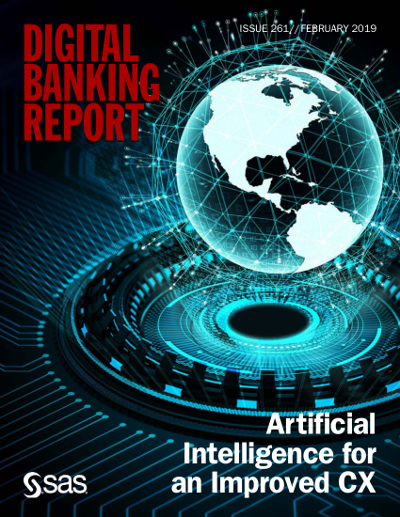 For the first time, the Digital Banking Report surveyed financial institutions worldwide to determine how data is being collected and used for the benefit of the consumer. Our global survey looks at the most significant digital-related trends that are driving marketing and customer experience strategies in the banking industry, with a focus on understanding what financial institutions are prioritizing and what they regard as the greatest challenges. While our research made it clear that financial executives understand the importance of data and analytics as a primary component to improving the customer experience, it is also clear that most financial institutions are still far from maximizing the potential of data and analytics to build personalized engagement. In fact, it is clear than many organizations focus on using data for better reports more than better experiences. The good news is that the results of our survey are consistent with other industry research, indicating that an overwhelming majority of banking and credit union executives worldwide who use data analytics noticed it improves their ability to deliver a superior customer experience. We believe we have developed the most comprehensive analysis of the use of data for an improved customer experience in the banking industry. This would not have been possible without the support and sponsorship from SAS, one of the foremost leaders in delivering data and analytic solutions to the banking industry. We believe this report will provide valuable insights into how organizations are using data, AI and advanced analytics to improve the customer experience and hope that it will help you with your planning and implementation processes.